1 of 4 In a small saucepan, stir together ketchup, vinegar, sugar, Worcestershire, 1 teaspoon oil and mustard. Bring to a simmer and cook for 5 minutes. 2 of 4 Score surface of ham, making diamond shapes 1/2-inch deep. Place ham in a 4- to 5-quart slow cooker and brush generously with the barbecue sauce. 3 of 4 In a large bowl, stir together potatoes and remaining tablespoon of vegetable oil. 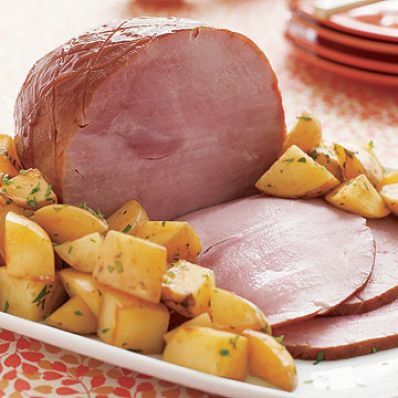 Place potatoes around ham in slow cooker. Cook for 2 hours on HIGH or 5 hours on LOW, brushing ham generously with sauce once every hour. 4 of 4 Remove ham from slow cooker and set aside. Stir parsley, salt and pepper into potatoes and serve with ham and remaining sauce.